Mainstream news websites usually do this kind of retrospective at the end of each year. Few fan newswriters do, but seeing Michael Hinman at Airlock Alpha have so much fun with his edition I decided to give it a whirl. It’s not a ha-ha kind of fun, for some items are rather sad, it’s the challenge and exercise of fannish creativity that makes such projects fun. 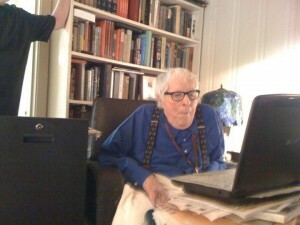 Ray Bradbury seeing Rachel Bloom’s video for the first time. Rachel Bloom’s “F*** Me, Ray Bradbury” music video received a Hugo nomination but lost to a Doctor Who episode. John King Tarpinian complained so vehemently (in private e-mails) that I ran a case study of the runoff vote for him. There was little suspense involved — as Who episodes were eliminated their votes were redistributed to the remaining Who episodes until one prevailed. (V*** for Me, Ray Bradbury!, Inside the 2011 Hugo Voting Statistics, Rachel Bloom at Renovation). Bradbury made a more orthodox impact on the internet when, for the first time, his novel Fahrenheit 451 could be purchased in electronic format (Harder To Burn This Way). This past year Bradbury fans had a chance to rent his old Palm Springs home (Rent Bradbury’s Old Palm Springs Retreat), drink a cocktail named after his book Fahrenheit 451 (Heat Ray) or listen to online reruns of his radio plays (CART Broadcasts “The October Country”). This beloved writer quietly marked his 91st birthday in August (Ray Bradbury Turns 91). Mike Glicksohn accepts Susan Wood’s Hugo, which she won posthumously in 1981. Photo by Andrew Porter. The loss of Mike Glicksohn, a pillar of his generation, forced many of my contemporaries into the unpleasant realization that a network of friends and acquaintances we have been expanding all our lives has begun to contract. An iconic figure at conventions with his flowing beard and Australian bush hat, Glicksohn passed away on March 18 after suffering a stroke. This came at the end of a years-long struggle with cancer. He was 64. (Mike Glicksohn (1946-2011), Service for Mike Glicksohn, Murray Moore: Glicksohn Memorial Report, Andrew Porter: Mike Glicksohn Photo Gallery, Taral Wayne: After the Piper Played). Sam Stone, who returned a British Fantasy Award. Renowned horror editor Stephen Jones went home from the British Fantasy Awards ceremony at Fantasycon and wrote “Putting the ‘Con’ Into Fantasycon,” accusing awards administrator David Howe with a conflict of interest because he is a partner in Telos, the publisher of two BFA-winning stories and winner of Best Small Press, and also is the domestic partner of Sam Stone, winner of two fiction BFA’s. The ensuing controversy led Howe to resign as chair of the British Fantasy Society and Stone to announce she was returning one of her BFA’s. Novelist Graham Joyce succeeded as acting chair of the BFS. (Along Came Jones, Stone’s Beau Geste, Howe Quits as Chair of BFS, Re: Joyce). 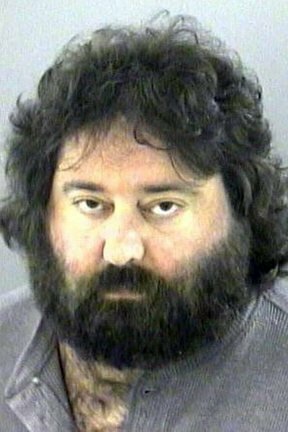 Dragon*Con founder Ed Kramer, who for the past decade has delayed trial on child molestation charges in Georgia by arguing he is too ill to participate in his own defense, was arrested in Connecticut after authorities were tipped that he was staying in a motel room with a 14-year-old boy. He was charged by Milford Police with misdemeanor reckless endangerment of a child and is currently fighting extradition to Georgia. The Gwinett County District Attorney contrasted Kramer’s last appearance in a Georgia court, leaning heavily on a cane and breathing oxygen through a mask, with the description given by three witnesses in Connecticut who say they saw him hiking on trails, not using a cane or his breathing apparatus. (Kramer Arrested in Connecticut, Kramer Pretrial Hearing Today, Kramer Freed on Bond in Connecticut, DragonCon founder Ed Kramer on a $250K bond, Kramer Extradition Hearing Delayed, Kramer Fights Extradition, Kramer in Jail Awaiting Extradition Hearing). Fans watched Borders Books go into its death throes with a morbid fascination, reluctant to part company with a place that had been so important to their reading experiences over the years, yet certain paper booksellers were being shouldered aside by electronic book distributors. (Is Borders Circling the Drain?, Free Associating About Borders, Borders Files for Bankruptcy, Borders Writing the Next Chapter — Eleven, Vendor Writes Off Borders Bad Debt, Today Is Borders Last Day). Aussiecon Four Artist GoH Shaun Tan won the Oscar in the Best Short Film (Animation) category for The Lost Thing, based on his book. (Shaun Tan Wins Oscar). He is the first former Worldcon GoH to win the award in competition. Roger Corman received an Academy Honorary Award from AMPAS in 2009, which is the same Oscar statuette. He also won the 2011 Astrid Lindgren Memorial Award for children’s and young adult literature (Shaun Tan Wins Children’s Lit Award). Melbourne-based Tan has illustrated more than 20 books, including The Rabbits (1998), The Lost Thing (2000), The Red Tree (2001), The Arrival (2006) and Tales from Outer Suburbia (2008). If Harlan Ellison is there, it’s news. If he’s absent, it’s news. His sayings are news. So are his silences. The absences have been especially worrying to Ellison-watchers. Harlan declared his final con appearance of 2010 as his last. And despite being slated to receive the 2011 J. Lloyd Eaton Lifetime Achievement Award in Science Fiction in person he was unable to attend due to poor health (Ellison To Miss Eaton Conference). He likewise missed his induction to the Science Fiction Hall of Fame (Ellison Added to SF Hall of Fame, Ellison’s Health Overshadows Hall of Fame Induction). Otherwise there was an incessant drumbeat of Ellison news throughout the year. He sold his typewriter (Jamie Ford Buys Ellison’s First Typewriter), was listed as one of SF’s Tough Interviews, and was allegedly referenced in the movie Paul (Ellison Reference in Paul? — though File 770 readers who saw it unanimously deny the claim). Burt Pretlusky wrote a memoir about authoring an episode of Jack Webb’s strident cop show Dragnet, saying that immediately after it aired Harlan Ellison called, snarled “I never knew you were a fascist!” and hung up (Harlan Ellison’s Hang-Up). The evil done to Harlan Ellison’s television scripts by cigar-chomping producers has long been part of his (and Cordwainer Bird’s) legend. So it was news that the master’s own versions of these scripts would be published (In the Original Babylonian), the prose as it came directly from his Olympia manual typewriter. Of greatest interest was Ellison’s latest copyright infringement suit alleging that In Time was based on Ellison’s 1965 short story “’Repent, Harlequin!’ Said the Ticktockman” (“Repent, Timberlake!” Said the Lawyerman). Just when it looked as if Harlan would extend his legal winning streak (Ellison Registers T.K.O.) the announcement was denied by the defendant’s lawyer (Niccol’s Attorney Answers the Bell) and we were suddenly left pointing fingers at the source of the bogus report (Internet Journalism at Its Most). George R.R. Martin has long been the kind of writer who connects with fans on a deeper level. As a result we’re not just fans of his stories but of his career. We cheer his mass media successes and mourn his defeats, the TV shows launched and canceled over the years, the best sellers, that kind of thing. (It’s Time, George) This year has been an uninterrupted triumphal march. He was named to the Time 100 (George R.R. Martin Makes TIME 100) and declared USA Today’s author of the year. His merely finishing the manuscript of his latest novel A Dance With Dragons was big news (Alert the Media). When actually published, stores sold vast numbers of the novel (New GRRM Book Flying Off Shelves, GRRM a Kindle Millionaire). All things Martin turned to gold – Syfy and Universal Pictures acquired the film rights to the unrelated anthology series Wild Cards (Wild Cards Movie in the Works). Sir Terry Pratchett’s views about euthanasia have received constant attention from the mundane media while going unremarked here. 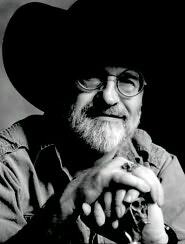 However, he was so often in the news for his writing and other professional activities that Pratchett’s doings continued to be of utmost significance to genre reporters. His writing for teens earned him the Margaret A. Edwards Award (Pratchett Wins 2011 Edwards Award). He even launched an award named for himself — the Terry Pratchett Anywhere But Here, Anywhen But Now First Novel Prize. (Pratchett Award Shortlist Announced, Pratchett Picks Prize Winners). Sir Terry also came to the U.S. to promote his latest Discworld novel, Snuff, and made a surprise visit at Capclave (Pratchett Coming to America, Pratchett at Capclave). Chris Garcia’ & James Bacon’s The Drink Tank was the first real fanzine to win the Hugo in three years. The video of Chris’s super-emotional reaction went viral, getting over 43,000 views. His hometown San Jose paper also paid tribute (Media Covers Garcia’s Hugo Win). That would have been enough newsmaking for anyone else in an average year, but Chris and James were also on the verge of putting out The Drink Tank #300.The issue appeared in November: 320 contributions filling 272 pages. The dynamic duo has inspired some individual news items, too, like Why Chris Has the Coolest Job, about his interview in Obsolete Gamer, and alerts about James Bacon’s items on Forbidden Planet like China Miéville on Comics. Update 01/01/2012: Lowered the “c” in Aussiecon 4 to half-mast. This entry was posted in Editorial Notes and tagged Chris Garcia, George R. R. Martin, Harlan Ellison, James Bacon, Mike Glicksohn, Ray Bradbury, Stephen Jones, Terry Pratchett by Mike Glyer. Bookmark the permalink. And you see, I would totally have rather had that C capitalized! Oh, my. 43,000 views! I had no idea it was quite that many! Making the effort to drag a nice suit from Australia to the US totally worth it, but I wish I’d made a better joke if I’d known I was going to get quite that much of Chris’s spotlight.